Premises liability is an area of law that applies to injuries people suffer on another party’s property because of defective or unsafe premises. Property owners have a duty to exercise reasonable care in keeping their premises safe for all visitors. While many people who are injured in premises liability accidents often think that property owners were clearly at fault for their injuries, property owners (and especially their insurance companies) are much more likely to see things very differently. In many cases, a property owner will argue that a victim’s injuries were completely the result of their own negligence. If you suffered serious injuries or your loved one was killed because of a property owner’s failure to maintain safe premises in Maryland, it will be critical for you to seek legal representation as soon as possible. Make sure that you contact CHASENBOSCOLO right away. Our firm will work tirelessly to help you obtain all of the compensation you are entitled to. Call (301) 220-0050 or contact us online to take advantage of a free consultation. You are going to want an attorney for your premises liability case simply to have somebody on your side. As soon as you express any interest in filing an injury claim, the property owner and their insurance company will be prepared to argue that you are not entitled to compensation. An insurance company will usually assign a claims adjuster to your case, and they will usually conduct their own investigation. As part of their investigation, they will often ask victims to provide recorded statements about their accidents. You should always refuse any invitation to provide a recorded statement. These efforts are usually traps for most people, as the claims adjuster or other insurance agent are trained to get a victim to say things that unknowingly damage their personal injury claim. In other cases, an insurance company could quickly offer you a lump sum settlement. You are right to doubt whether this offer is as much as you are entitled to because chances are very good that it is nowhere near what you could actually be owed, and a lawyer can work to make sure that you receive every last dollar that you need and deserve. CHASENBOSCOLO has been helping people all over Maryland who were injured in various kinds of accidents since 1986. 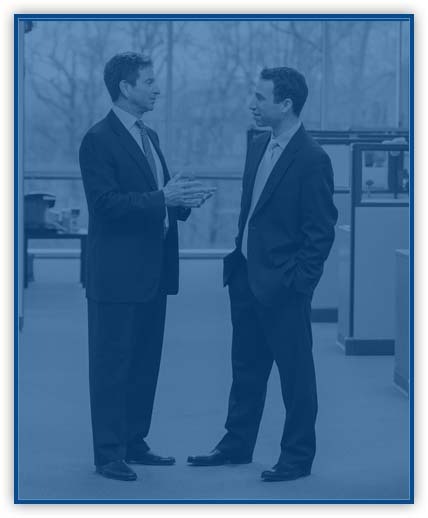 Our firm has a team of 25 lawyers and over 90 professionals with more than 100 years of combined legal experience. Barry M. Chasen was named to the National Trial Lawyers Top 100 Trial Lawyers in 2013. Benjamin T. Boscolo has been a workers compensation panelist for the National Football League Players Association (NFLPA). Both Mr. Chasen and Mr. Boscolo have received an AV Preeminent rating from Martindale-Hubbell, a peer rating denoting the highest level of professional excellence. We make it a point to be available 24 hours a day, seven days a week. CHASENBOSCOLO also provides the No Fee Guarantee® so you pay absolutely nothing until you receive a financial award. Our firm can negotiate a fair and full settlement to your case. If the insurance company is unwilling to provide an adequate amount, then we can file a lawsuit to try your case in court. For some victims, these cases can be difficult because the property owners are friends, family members, or neighbors. In many cases, the property owner is usually a business entity. Some cases can be complex because they may involve multiple liable parties. You will want to have a lawyer simply to make sure that you are able to hold every party accountable. People can sustain a wide variety of injuries in these cases. Some people may recover relatively quickly, but many others can have lifelong complications because of these accidents. When an individual dies in a premises liability accident, their family members can file a wrongful death lawsuit against the negligent parties. If you or someone you love was hurt in an accident due to a property owner’s negligence, you have the right to take decisive legal action. Unfortunately, many people are unaware of their rights and may be afraid to ask the important questions. The attorneys of CHASENBOSCOLO are here to help you understand what compensation you may be owed and how the legal process works. Schedule a confidential consultation with our team today, and read a few of our FAQs below. Contributory negligence of a plaintiff will ordinarily bar their recovery of damages, but a defendant is still required to prove contributory negligence by a preponderance of the evidence. Contributory negligence is one of the main reasons that you will want to avoid speaking to any insurance company, because many insurers will immediately seek any way possible to transfer at least some of the blame for an accident to the victim. What damages could I recover in a premises liability lawsuit? Many premises liability cases are ultimately resolved through settlements, as insurance companies will typically deem settling a case to be preferential to going to trial. Some cases will go to trial, and a victim who is successful can be awarded various compensatory damages. Compensatory damages are often a combination of economic damages and noneconomic damages. Economic damages are awards for tangible costs a victims has incurred or will incur like medical bills, lost wages, and property damages. Noneconomic damages are much more subjective, usually involving awards for pain and suffering, emotional distress, or loss of consortium. Maryland Courts and Judicial Proceedings Code § 3-2A-09 establishes that noneconomic damages have a limit (often referred to as a “cap”) of $860,000 in 2019. Under the state law, the limitation on noneconomic damages increases by $ 15,000 on January 1 of each year. What needs to be proven to win a premises liability case? When you file a premises liability lawsuit against another person or organization, you will usually be required to prove that their negligence caused your injuries. Doing this will require you to prove four things. First, the defendant must have had some kind of duty of care, usually to make sure a guest is not hurt on their property. Next, you must prove that the defendant breached that duty and then that the breach of duty caused your injuries. Finally, you will have to prove that the injuries caused you to suffer damages. What should I do if I was involved in a premises liability accident? The first thing that you should do any time you are involved in an accident on another person’s property is immediately seek medical attention. This is true even when you do not believe that you were hurt. Do not get into an argument with the property owner about fault. If you are able, you should take pictures of everything involved in your accident, specifically the particular hazard that caused your injuries. Try to do this before a property owner has the opportunity to correct the danger. If other people saw your accident, make sure that you know their names and phone numbers. When you cannot take these steps at the accident scene yourself, then ask a friend, family member, or neighbor to do this for you. Make sure that you contact an attorney before speaking to any insurance company. How long do I have to file a premises liability lawsuit? Maryland Courts and Judicial Proceedings Code § 5-101 establishes that a person has three years from the date of an accident to file a civil action. The state does provide a couple of exceptions to the statute of limitations, however. A minor who is injured in a premises liability accident can have their limitations period tolled (delayed) until they reach the age of majority which is 18 years of age. A person who is incapacitated as the result of their accident can also have their limitations period tolled until their incompetency ends. Did you sustain catastrophic injuries or was your loved one killed as the result of a property owner’s negligence in Maryland? You should not have to struggle because of another party’s failure to maintain their premises or warn you of potential hazards. CHASENBOSCOLO fights to help people injured in premises liability accidents recover every single dollar of compensation they are entitled to. You can have our lawyers examine your case when you call (301) 220-0050 or contact us online to set up a free consultation.